Like the last couple of weeks, this week is also about co-management. This week is all about another nice detail that can be really useful, in specific use cases. That detail is the ability to always apply a configuration baseline to co-managed devices. Even when the Device configuration workload is switched from Configuration Manager to Microsoft Intune. That can be useful for configurations that are not available yet via Microsoft Intune, or for compliance checks that need to be performed and consolidated in one location. In this post I’ll provide a short introduction about the different configuration options, followed by the steps to configure a configuration baseline to co-managed devices when the workload is switched to Microsoft Intune. I’ll end this post with the end-results. Let’s start by having a look at the configuration. I’ll do that by going through an example that will create a baseline to verify the update compliance of co-managed devices. That will provide an easy method to verify compliance and consolidate the results. Below are 4 steps that walk through the process. On the Create Configuration Baseline dialog box, provide the following information and click OK to create the configuration baseline. Explanation: The check Always apply this baseline even for co-managed clients in the baseline will make sure that the baseline is always applicable to co-managed devices. Even when the Device configuration workload is set to Microsoft Intune. On the Create Configuration Baseline dialog box, click Add > Software Update to open the Add Software Updates dialog box. On the Add Software Updates dialog box, find the required software update and click OK. Explanation: This configuration will make sure that this baseline will verify the compliance of all co-managed devices for the latest cumulative update. Right-click the just created baseline and click Deploy to open the Deploy Configuration Baselines dialog box. Leave everything default, select the collection for this baseline deployment and click OK. 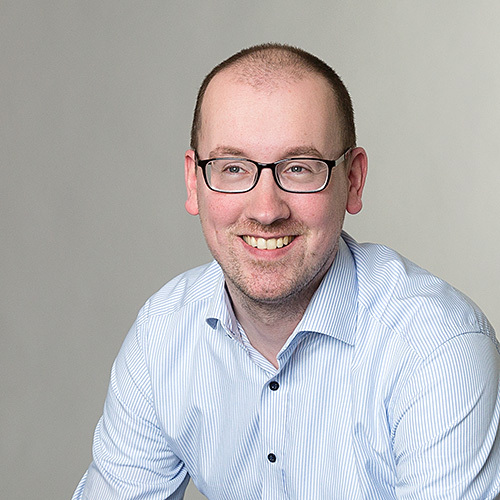 Explanation: This configuration will make sure that this baseline is deployed to the required collection and will make sure that this baseline is only used for compliance and not for remediation. Note: The setting Always apply this baseline even for co-managed clients in the baseline, as mentioned in step 3a, can be used to make sure that the baseline is always applied on co-managed devices. Now let’s continue by having a look at the results on a co-managed device. Below are two examples of one of a co-managed device. First an overview of the Configuration Manager Properties, followed by a look in the DCMAgent.log file. Both are client-side details, as the server-side will provide status information similar like for any other device. For more information about co-managed devices and configuration baselines, please refer to this article about creating configuration baselines in System Center Configuration Manager. Restarting a computer couldn’t be easier! This week I’m still staying in the new features of Configuration Manager, version 1710. This time it’s all about how easy it became to restart a client device. Restarting a client device became a right-click action! It simply couldn’t be easier! This opens up a whole new world for managing client devices with a pending restart. In this blog post, I’ll start with a short introduction about restarting a client device, followed by the simple actions to trigger a restart for a client device. I’ll end this post by following the activity through the log files. Starting with Configuration Manager, version 1710, it’s possible to use the Configuration Manager console to identify client devices that require a restart, and then use a client notification action to restart those client devices. When the restart notification is received by a client device, a notification window opens to inform the user about the restart. By default, the restart occurs after 90 minutes. That might sound like a long period, but that’s related to the configuration of the Client Settings. The restart simply honors the restart behavior, as configured in the Computer Restart tab of the Client Settings. Note: Of course it’s not required for a client device to have a pending restart, before the restart option becomes available. The restart option is available for every client device. On the Configuration Manager dialog box, select OK to confirm the restart action for the client device. On the client device, a Software Center notification window opens to inform the user about the restart. This notification can not be ignored. It provides a countdown and the option to RESTART or HIDE. BgbServer.log: This log file records the activities of the notification server, such as client-server communication and pushing tasks to clients. It also records information about the generation of online and task status files to be sent to the site server. When triggering a restart of the client device, this log file shows the information about pushing the restart task to the client device, followed by information about the generation of the BGB task status report (.BTS) in the bgb.box inbox (see below). CcmNotificationAgent.log: This log file records the activities of the notification agent, such as client-server communication and information about tasks received and dispatched to other client agents. When triggering a restart of the client device, this log file shows the arrival of the restart task on the client device (see below). bgbmgr.log: This log file records details about site server activities related to client notification tasks and processing online and task status files. When triggering a restart of the client device, this log file will show information about processing the created BGB task status report (.BTS) from the bgb.box inbox. Note: The log snippets above show how quick the notification arrives on the client device. In my test environment that was within the same second. For more information about the restart client device option, please refer to this article about How to manage clients. Like last week I’m staying in the world of new features of Configuration Manager, version 1710. This time it’s all about the awesome world of child task sequences. Awesome. To be a bit more specific, the awesome world of child task sequences, which refers to the newly introduced task sequence step Run Task Sequence. This opens up a whole lot of options, from using specific standards throughout all deployments until enabling different administrators from maintaining their own child task sequence. In this post I’ll go through a short introduction about the Run Task Sequence step, followed by the configuration options for the Run Task Sequence step. I’ll end this post with the end result of running a child task sequence, by showing how it’s logged. Note: Make sure to go through the information mentioned in the More information section, as the second link provides useful information about the abilities. Now let’s have a look at the available configuration options for using the Run Task Sequence step. The four steps below walk through those configuration options. After that, the parent task sequence can be deployed like any other task sequence. However, when deploying a parent task sequence, be aware that the criteria for showing the “high-impact” warning is not detected in Software Center when the child task sequence contains the “high-impact” steps. In that case, use the User Notification properties of the parent task sequence to force the “high-impact” warning. In the Run Task Sequence step, it’s as simple as browsing to the task sequence and selecting it. Note: It’s not possible to select a task sequence that contains a boot image reference. The boot image reference has to be on the parent task sequence. Note: Keep in mind that any chain containing a disabled task sequence will fail and that the Continue on error won’t work for that step containing the disabled task sequence. Let’s end this post by having a look at the end result. I’ll do that by looking at the smsts.log file and by looking at the deployment status in the Configuration Manager administrator console. When looking at the deployment status, see screenshot below, the first section shows the start of the parent task sequence and the second section shows the start of the child task sequence, like a group within a normal task sequence. When looking at the smsts.log, something similar is shown, see screenshot below. The start of the child task sequence is shown like the start of a group within the parent task sequence. A while ago I did a blog post about managing AppLocker on Windows 10 via OMA-DM. During that post I showed how to use OMA-DM, via Microsoft Intune hybrid and standalone, to configure AppLocker. In this post I’ll do something similar for setting up kiosk mode on Windows 10. Windows 10 Enterprise and Windows 10 Education provide a configuration service provider (CSP) for setting up kiosk mode. That’s the AssignedAccess CSP. During this blog post I’ll go through the AssignedAccess CSP, and its required input, I’ll go through the configuration steps in Microsoft Intune hybrid and standalone and I’ll show the end-user experience with the Twitter app as an example. Before using the AssignedAccess CSP it’s good to get a better understanding of the CSP. The CSP is used to set up the Windows 10 device to run in kiosk mode. Once the CSP has been executed, then the next user login, that is associated with the kiosk mode, puts the Windows 10 device in the kiosk mode running the specified application. Let’s go through the nodes of the AssignedAccess CSP. Now it’s time to use the AssignedAccess CSP to set up Windows 10 devices in kiosk mode. In this configuration I’m going to use the Twitter app as an example for my domain user account and I’m going to show the required configuration for Microsoft Intune standalone and hybrid. Let’s start with the configuration in Microsoft Intune hybrid. I’ll walk through the required steps to configure the required Configuration Item. Select Windows 8.1 and Windows 10 with Settings for devices managed without the Configuration Manager client. 6 On the Additional Settings page, click Add to open the Browse Settings dialog box. Note: This created a configuration item that can be deployed like any other configuration item, as a part of a configuration baseline. Let’s continue with the same configuration within Microsoft Intune standalone. I’ll walk through the required steps to configure the required Configuration Policy. 7 In the Manage Deployment dialog box, select a group click Add and click OK.
Let’s end this post with the most important thing, the end-user experience. After the device receives the new configuration and the configured end-user logs on, the end-user will receive a full screen Twitter app as shown below. The end-user won’t be able to close the Twitter app and can only get out of the kiosk mode by pressing Ctrl+Alt+Del. That will bring the end-user back to the logon screen. This is a short and quick blog post to point out where to start with troubleshooting Windows 10 device enrollment issues and Windows 10 device management issues. To start with troubleshooting, it’s important to know where to find the information about the device enrollment issues and the device management issues. This short and quick post will show the location of that information, starting with Windows 10 build 1511. (Optional) Right-click the Debug node and select Enable Log to enable detailed logging. Note: When automatic device enrollment is configured with an Azure AD join, the User Device Registration node will provide helpful information for everything before the device enrollment. For more information about troubleshooting mobile device management failures on Windows 10 devices, please refer to Diagnose MDM failures in Windows 10. 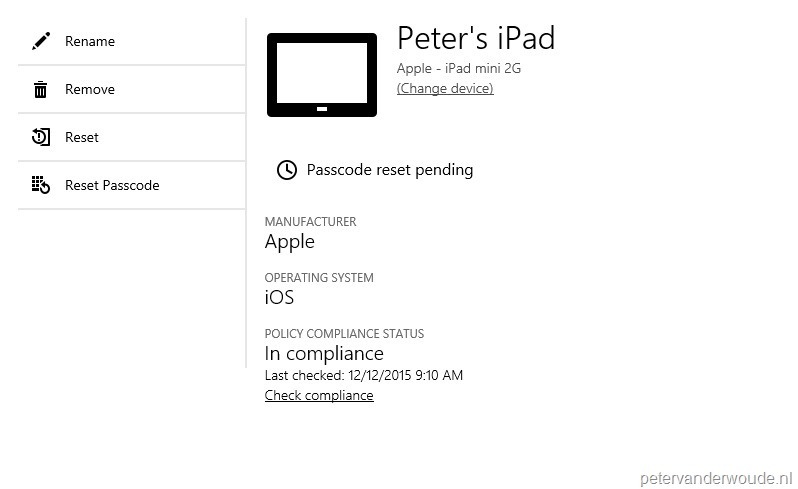 When are devices blocked after enabling conditional access? This week a blog post with only one purpose, and that purpose is, providing an overview. 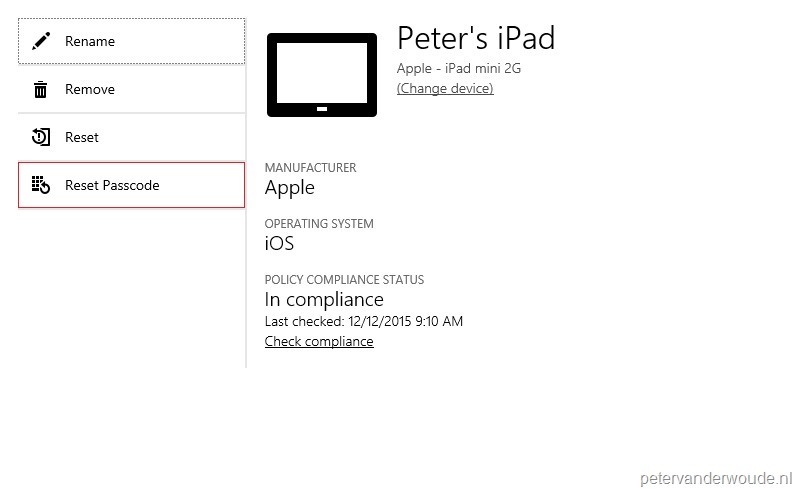 Providing an overview about when devices will be blocked after enabling conditional access. That information is available in the TechNet documentation (see the More information section of this post), but it might be a bit difficult to find. As the question pops up in the TechNet forums at a regular basis, I got the suggestion that it would be a good idea to provide a quick, but clear, overview. This post will provide nice tables, for Microsoft Intune standalone and Microsoft Intune hybrid, with the time it will take before a device will be blocked from Exchange. That information will be provided for two different setups and three different scenarios. A quick spoiler, the tables for Microsoft Intune standalone and Microsoft Intune hybrid are identical. Let’s have a look at the mentioned overview tables for Microsoft Intune standalone and Microsoft Intune hybrid. However, before looking at the overview tables, it’s important to understand the following details about the scenarios. After user un-enrolling device – This scenario is applicable when the end-user has un-enrolled its device. Below is the overview table for Microsoft Intune standalone. Note: The legacy Exchange Online Dedicated is identical to Exchange on-premises. Below is the overview table for Microsoft Intune hybrid. A while ago I did a blog post about managing Windows Defender of Windows 10 via OMA-DM. During that specific post I showed how to use OMA-DM, via Microsoft Intune standalone and hybrid, to configure Windows Defender. In this post I’ll do something similar for AppLocker. However, I have to admit that it was a bit more challenging for AppLocker. The main difference is that Windows 10 includes many different separate policy settings for Windows Defender, but provides a separate configuration service provider (CSP) for AppLocker. During this post I’ll show how to create the required AppLocker XML, what the AppLocker XML looks like, what the AppLocker CSP looks like and how to combine the AppLocker XML and the AppLocker CSP. I’ll end this post with the end-user experience. During this post I’ll use the build-in Windows 10 app Candy Crush Soda Saga as an example. The required AppLocker XML can be created by using the Local Security Policy snap-in, the Local Group Policy Editor snap-in or the Group Policy Management snap-in. Any of these snap-ins will work in a similar way for creating the required AppLocker XML. It doesn’t matter which snap-in is used, as long as it’s being used on a Windows 10 device. That makes it easier with configuring and selecting the required apps. During the following twelve steps, I’ll use the Local Group Policy Editor snap-in for configuring the Candy Crush Soda Saga app. Now let’s have a look at the AppLocker XML that I just created. That AppLocker XML should look like the one shown below. It should show a default allow rule and a specific deny rule on the Candy Crush Soda Saga app, both within the RuleCollection element of the Appx type. That element of the AppLocker XML is what’s required during the further configurations. Name="(Default Rule) All signed packaged apps"
Before using the AppLocker CSP it’s good to get a better understanding of the different nodes. The AppLocker CSP contains nodes for the different configuration components of AppLocker. Let’s go through these different nodes. Policy – Defines the policy for launching executable applications, Windows Installer files, scripts, store apps, and DLL files. The contents of this node is precisely the RuleCollection element as discussed in the previous paragraph. Now it’s time to use the created AppLocker XML for configuring Windows 10 devices. The key with this is that only the RuleCollection element is required that matches with the node in AppLocker CSP. With the RuleCollection element of the Appx type, I need the StoreApp node in the AppLocker CSP. This is applicable to Microsoft Intune hybrid and standalone. Let’s start with the configuration in Microsoft Intune hybrid. I’ll walk through the required steps to configure the required OMA-URI configuration item. Note: [MyGroup0] is a custom GUID that can be literally anything. That GUID makes sure that the un-enrollment of a device will behave as expected. Note: The complete RuleCollection element, about the Appx type, should be provided in this compliance rule configuration. Let’s continue with the same configuration within Microsoft Intune standalone. I’ll walk through the required steps to configure the required OMA-URI configuration policy. Note: [MyGroup0] is a custom GUID that can be literally anything. That GUID makes sure that the un-enrollment of a device will behave as expected. Also, the complete RuleCollection element, about the Appx type, should be provided in the value configuration. Let’s end this post with the most important thing, the end-user experience. Actually, the end-user experience will be exactly the same as with a local or domain group policy configuration. The end-user will receive the message as shown below and the end-user can find messages in the Event Viewer. Those messages in the Event Viewer will wrongly indicate that the app is blocked by group policy. This week a short blog post about an issue that I ran into, and tweeted about, the other week. Due to the strange error message I thought it would definitely be blog worthy. The error description was 22004: Unsupported certificate configuration. However, the actual issue did not come close to what the description would imply. This post will provide a brief overview of the scenario, the issue and the solution. Let’s start with a brief overview of the scenario. The environment contains Active Directory Federation Services (AD FS) and Web Application Proxy (WAP) for providing single sign-on (SSO) to the cloud services of Office 365 and Microsoft Intune. Microsoft Intune is used in a hybrid configuration with ConfigMgr and is fully configured to deploy certificate profiles. The required Network Device Enrollment Service (NDES) is published through WAP. Now let’s have a look at the issue that I started seeing with deploying Certificate Profiles via Microsoft Intune hybrid to mobile devices. It is good to mention that it was working before. I started seeing the following combination of error messages on specific Certificate Profile settings. The first error message seems very straight forward. At least, assuming that it is accurate. However, as the Certificate Profile deployment was working before, I couldn’t imagine that the issue was related to the configuration of the certificate, certificate profile or certificate template. I had to look further. The first thing I did was checking the external availability of NDES. I did that by checking the external URL of NDES, via https://externalFQDN/certsrv/mscep/mscep.dll. That external URL gave me an HTTP Error 503. The service is unavailable error message. The logical second thing I did was checking the internal availability of NDES. I did that by checking the internal URL of NDES, on the WAP server, via https://internalFQDN/certsrv/mscep/mscep.dll. That internal URL gave me an expected 403 – Forbidden: Access is denied error message. Now the issue is narrowed down to the publishing mechanism used for NDES. In this case it turned out to be the Web Application Proxy Service service that was in a Stopped state. Simply starting the service again solved the issue. After looking a bit further, I noticed that the service initially failed to start due to connection issues with the AD FS server. By default, the service tries to restart twice. After the third failure the service won’t retry again. However, in this case the connection came back to life after the third failure of the service. In case the HTTP Error 503. The service is unavailable error message also shows while checking the internal URL of NDES, the problem is likely related to NDES itself. In that case the issue is likely related to the application pool, named SCEP, used by NDES. A good summary would be that the 22004: Unsupported certificate configuration error message is often related to any HTTP Error 503. The service is unavailable error message in the NDES publishing chain. 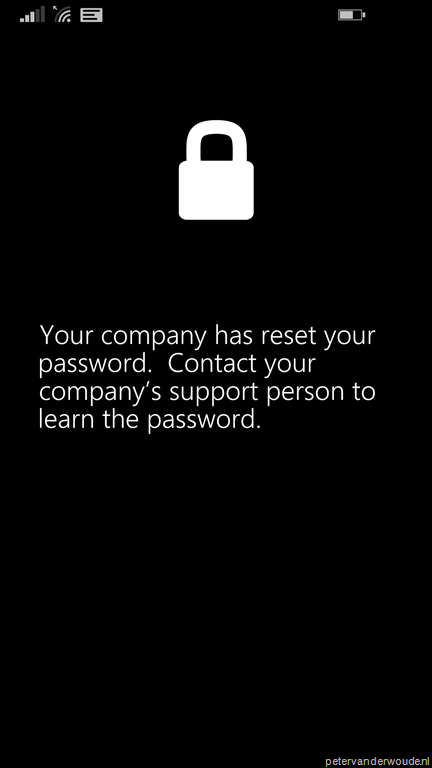 This week a blog post about the new ability in the Company Portal website to reset the passcode of a mobile device. Before only the administrator could reset the end-users’ passcode, but this has changed. Starting with the November update, of Microsoft Intune, a new option Reset Passcode is added to the Company Portal website. This option is available when the end-user is looking at the information of a specific mobile device. In this blog post I will go through the complete end-user experience. Starting with the end-user experience in the Company Portal website, followed by the end-user experience on the mobile device. I will end this post with a summarization per platform that will show the behavior of the (new) passcode. Also, a bit of topic, but this blog post was a good reason to verify my Remote Mobile Device Manager with the latest version of ConfigMgr and I can say that my Remote Mobile Device Manager fully works with ConfigMgr 1511! Now, lets start with the end-user experience in the Company Portal website. The end-user can logon to any device and use a web browser to navigate to the Company Portal website. After that the end-user can select the device of which the password must be reset and simply following the step. 1 In the Company Portal website the end-user must select the mobile device and select Reset Passcode. 2 After selecting Reset Passcode, the end-user will be prompted to sign out and sign in again. Select Sign out. 3 After signing out and signing in again, within 5 minutes, the end-user will be prompted to reset the passcode. Select Reset Passcode. 4 After selecting Reset Passcode, the end-user will be notified that a Passcode reset is pending. 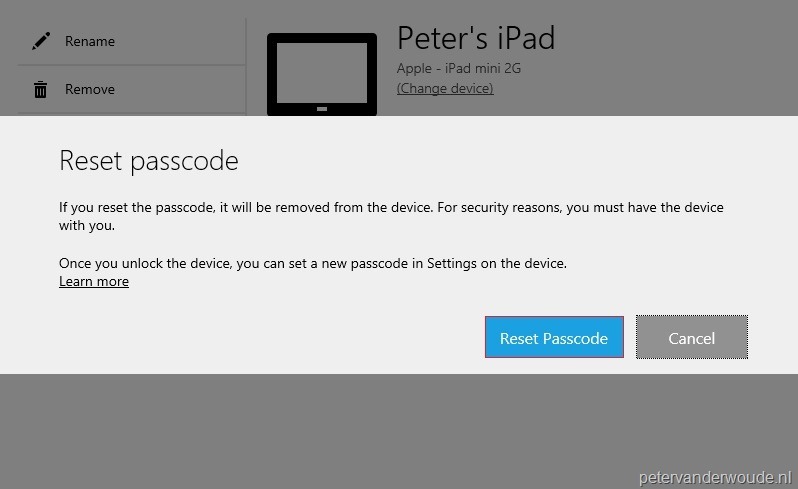 5a On an iOS device, managed by Microsoft Intune standalone or Microsoft Intune hybrid, the end-user will be prompted within a few minutes with Passcode successfully reset. 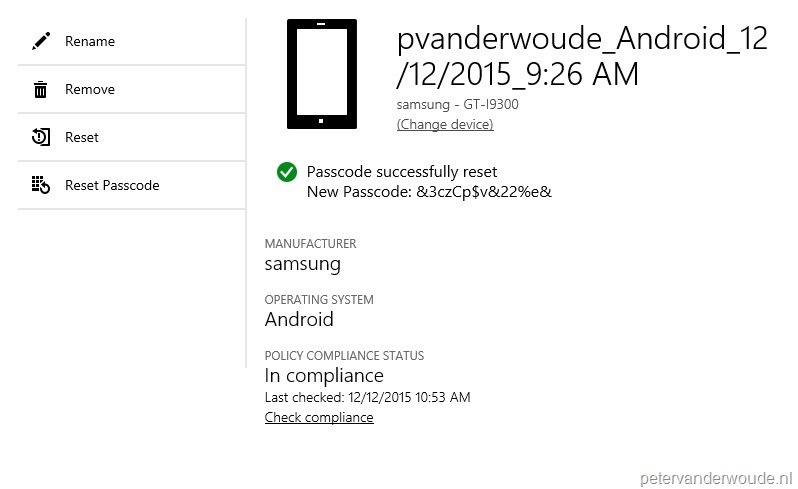 5b On a Windows Phone 8.1 device, managed by Microsoft Intune standalone, the end-user will be prompted within a few minutes with Passcode successfully reset and New Passcode: <Passcode>. 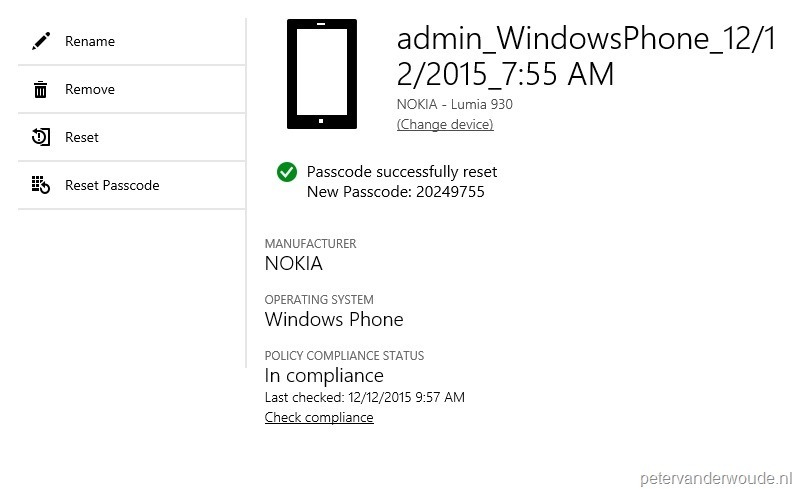 On a Windows Phone 8.1 device, managed by Microsoft Intune hybrid, the end-user will be prompted within a few minutes with Passcode successfully reset. 5d On an Android device, managed by Microsoft Intune standalone or Microsoft Intune hybrid, the end-user will be prompted within a few minutes with Passcode successfully reset and New Passcode: <Passcode>. After looking at the end-user experience in the Company Portal website its interesting to look at the end-user experience on the mobile device. Like with almost everything, the end-user experience is completely different on every platform. Below is the behavior shown, per platform, after the end-user has performed the reset passcode procedure. 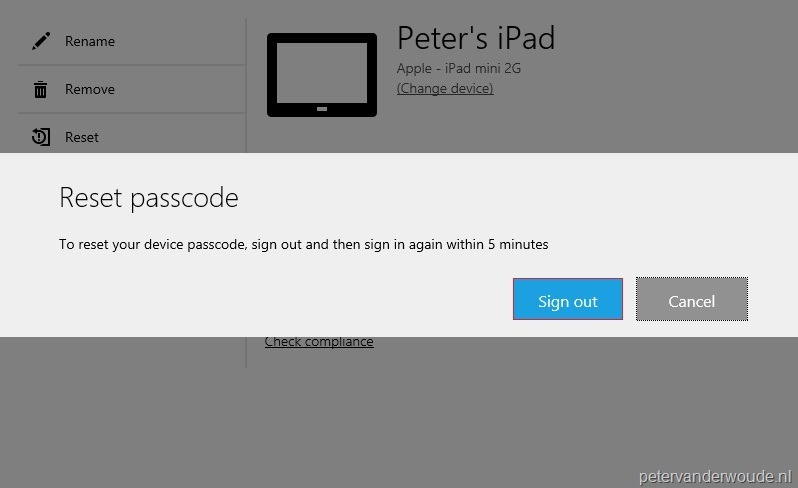 On an iOS device, the end-user will receive a message to change the passcode within 60 minutes. On a Windows Phone 8.1 device, the end-user will receive a message that the password was reset. 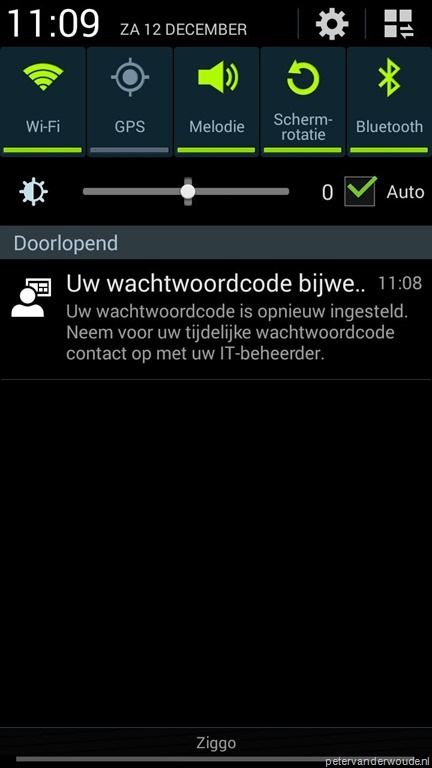 On an Android device, the end-user will receive a notification that a new temporary passcode was set. The last thing that I want to provide is an overview, per platform and per scenario, about the passcode behavior. In the table below I will show what happens to the passcode and where the new passcode can be found. The scenario refers to Microsft Intune standalone and Microsoft Intune hybrid. 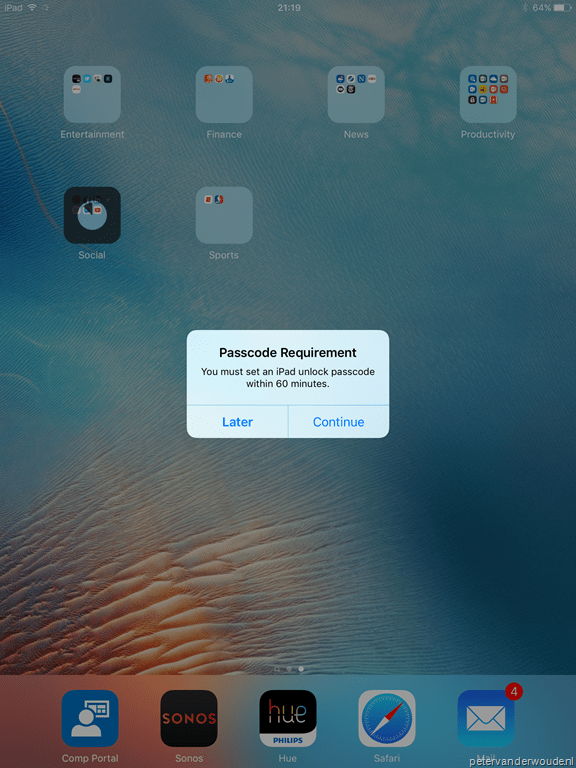 iOS Standalone and hybrid Removes the passcode from the device and gives the end-user 60 minutes to see a new passcode. 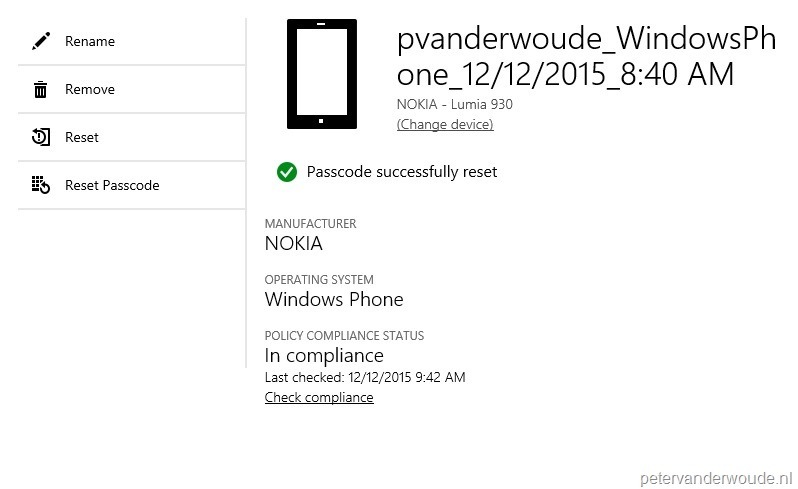 Windows Phone 8.1 Standalone Creates a new numeric passcode that is shown to the end-user in the Company Portal website. Android Standalone and hybrid Creates a new alphanumeric passcode, which is shown to the end-user in the Company Portal website. *At this moment the end-user experience on a Windows Phone 8.1 device, in a Microsoft Intune hybrid environment, is not working how it should be. The end-user has to contact the administrator to get the new passcode. Also, the administrator will only see the new passcode when a passcode reset has been performed before. If this is not the case, the administrator will have to perform another passcode reset to get the required new passcode for the end-user.